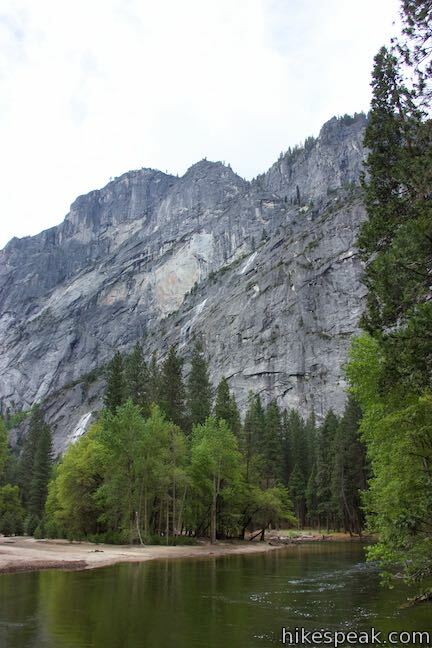 Yosemite National Park receives four million visitors per year, filling the park’s campgrounds and hotels. 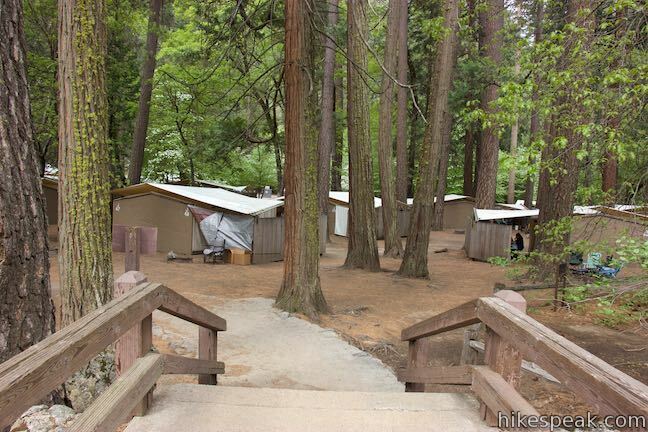 When all the campsites are reserved and the hotels have no vacancies (or list prices that are uncomfortably high), consider a middle option provided at Housekeeping Camp in the middle of Yosemite Valley. Housekeeping Camp offers 3-walled units with canvas roofs and flaps – imagine something that is not quite a room and not quite a tent. Each unit is half of a H-shaped structure with a common wall shared by the neighboring unit. 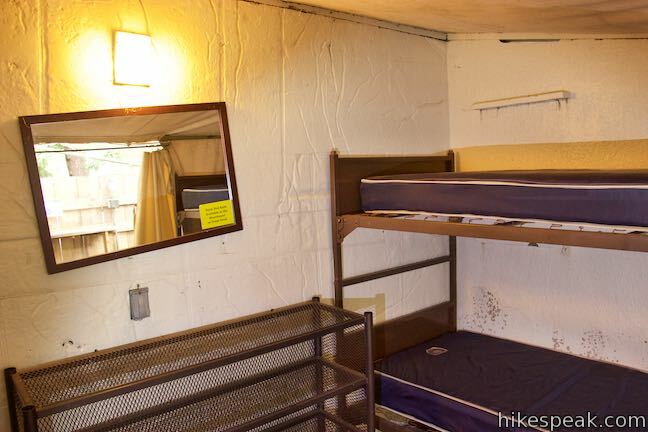 Units come with bedframes and mattresses, plus shelves, lights, outlets, and a mirror. 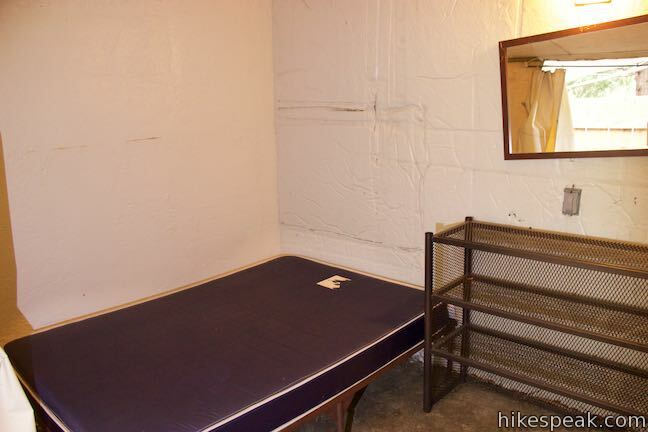 You won’t find maid service at Housekeeping Camp. 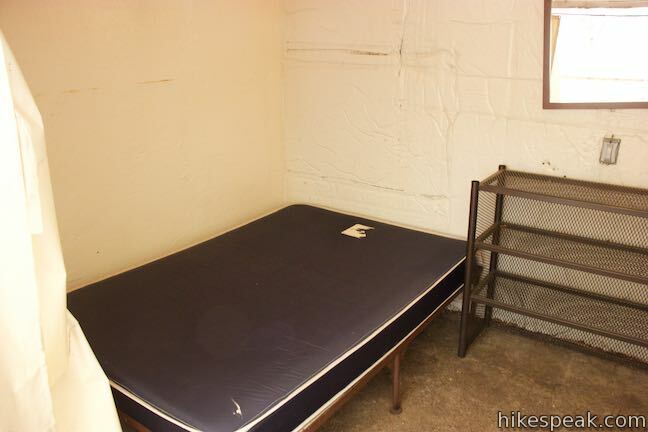 Guests need to bring their own bedding or rent bedding from the camp store. 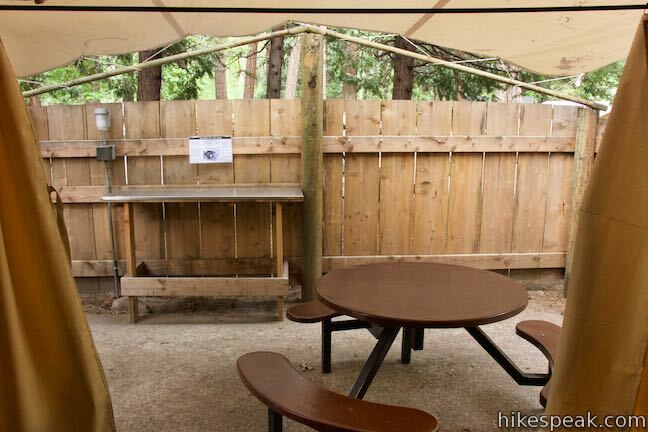 Outside, the units have covered patios enclosed by privacy fences with picnic tables and cooking areas. 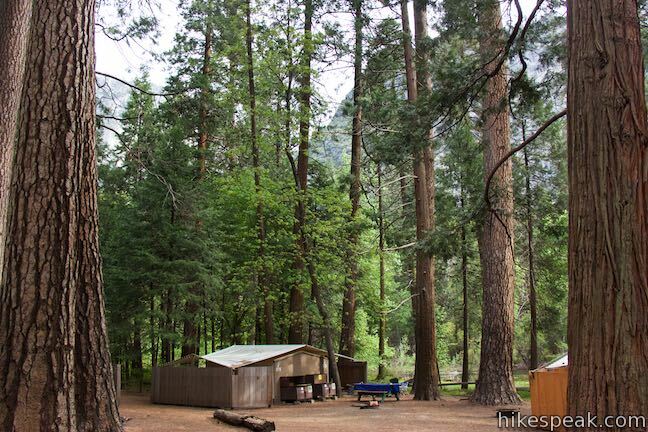 The best thing about Housekeeping Camp is that it is located right along the Merced River in Yosemite Valley. 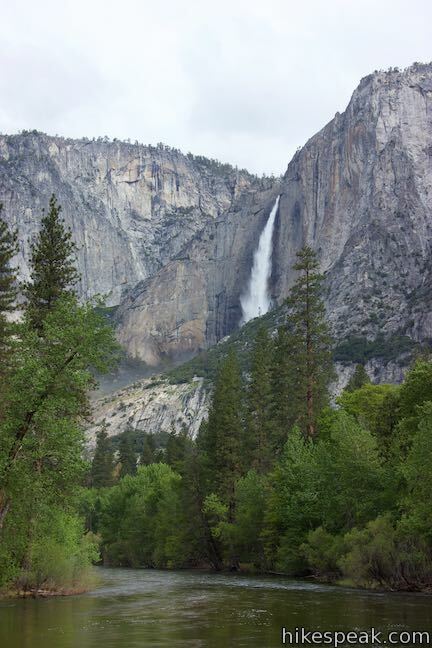 Step out onto a bridge crossing the river from Housekeeping Camp and you will be greeted by a glorious view of Yosemite Falls. The river has sandy beaches that are alluring on hot summer days. 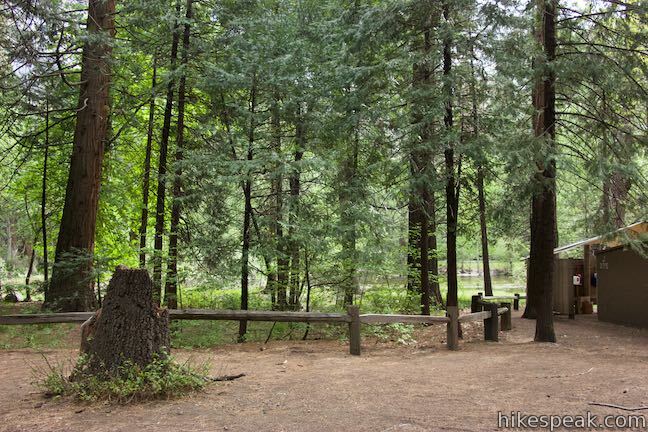 It is a 1-mile walk to Yosemite Village from Housekeeping Camp and the shuttle that stops just across the street offers easy access to the rest of Yosemite Valley. 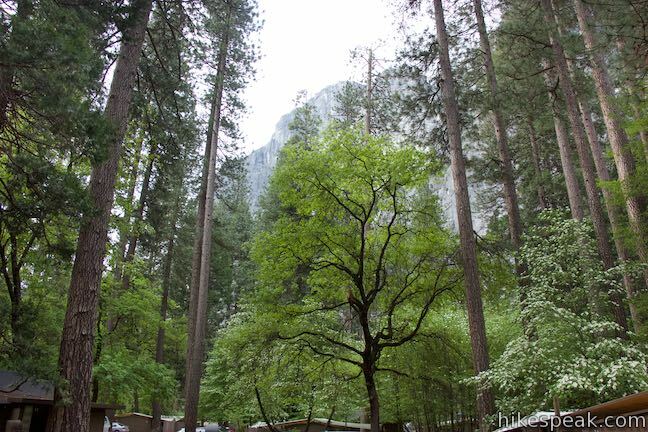 Housekeeping Camp is not exactly glamping, but you’ll be thankful for the cover whenever rainstorms saturate Yosemite Valley. 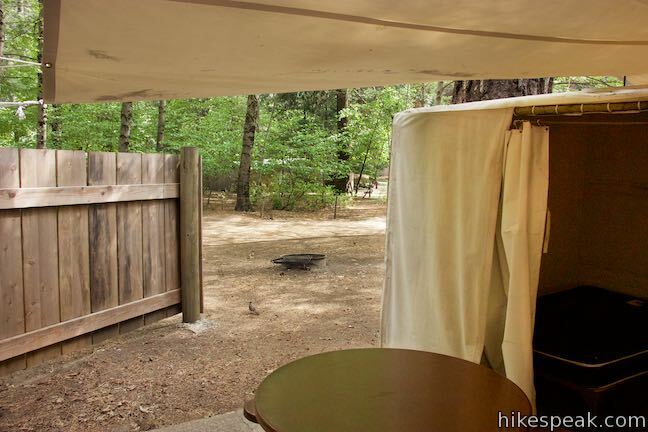 The Spartan accommodations are not completely closed-off to the elements and inquisitive chipmunks are bound to creep across your patio. The canvas flaps can be drawn closed at night, but units do not have locking doors. 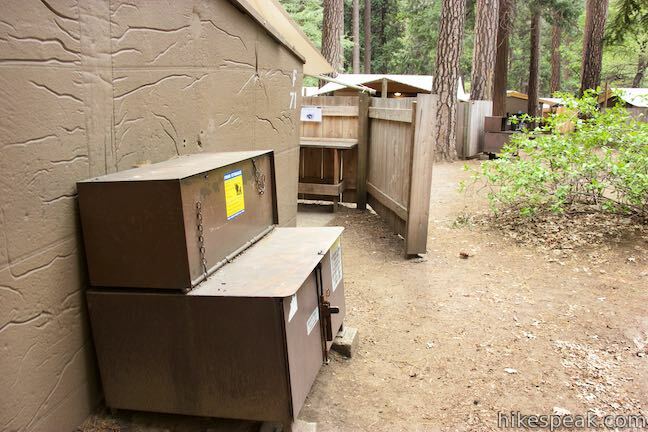 Large food storage lockers (bear boxes) outside each unit can be secured with padlocks. 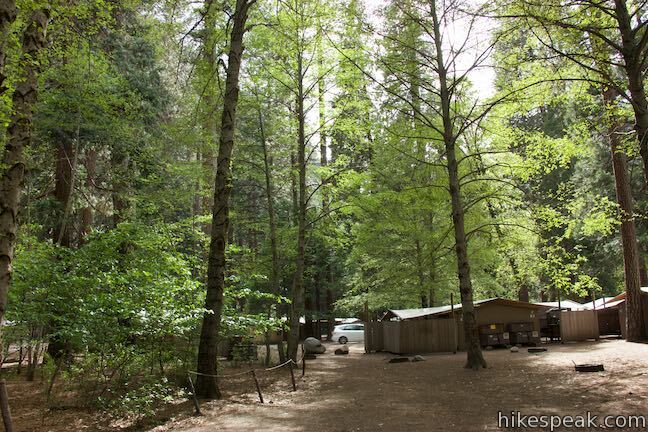 Housekeeping Camp shares many similarities with campgrounds (where you don’t have to set up a tent or sleep on the ground), but the “camp” has a different feel because some guests put a lot of effort into making their units feel like home, even stringing lights in the trees. 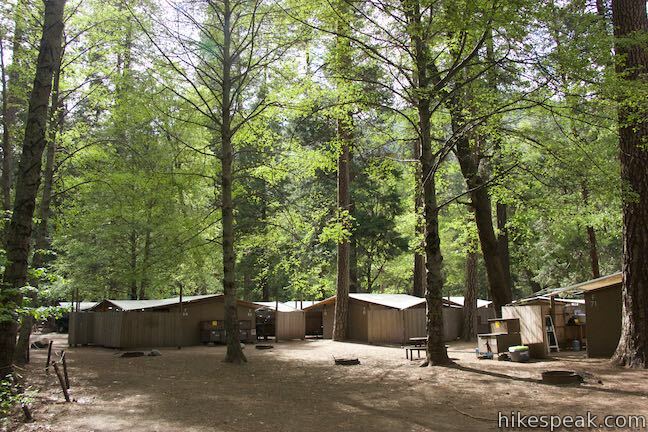 Housekeeping Camp is open from Mid-April to early October (weather permitting). Check-in time is 4 p.m. and checkout is by 11 a.m. The quiet hours are from 10 p.m. to 6 a.m. (you may wish to bring ear plugs). Pets are not allowed at Housekeeping Camp, so leave your dogs at home. Housekeeping Camp has a lot of units – 266 in all. 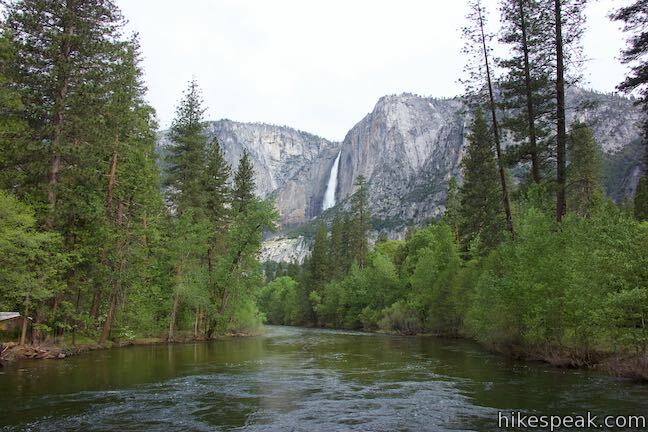 Some of these are “River Units,” which can be reserved at a higher rate in order to sleep next to the Merced River. (Be aware that some River Units are more along-the-river than other). 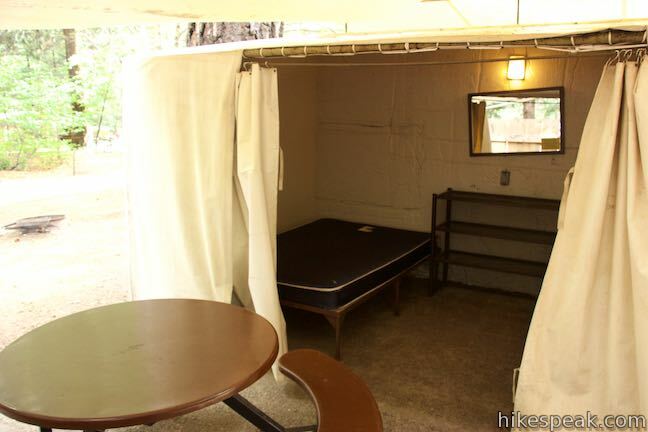 Every unit comes with a concrete slab and three concrete walls covered by a canvas roof and enclosed by canvas curtains. A little way to make your unit feel more like home would be to bring a small mat or rug to cover a bit of the concrete floor. Unlike a hotel room, the outdoor temperature is the only temperature available (no space heaters (or air conditioners) allowed). 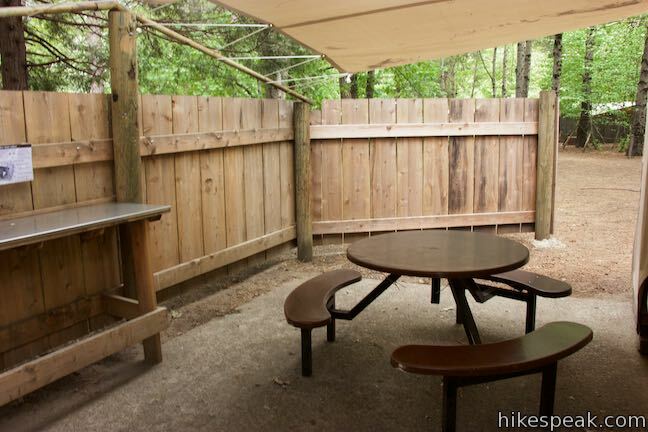 Guest can sit down for meals at a round table with bench seating in the patio area of each unit. An adjacent high-top table offers a good surface for cooking and cleaning. Just outside each unit is a campfire ring with a grill. All food, food-related items, and toiletries must be stored in the bear-proof lockers for each unit. Plastic bins with lids are a handy way to store things in the food lockers. Vehicles must be free of bear-attracting items. Vehicle parking is available near each site. Bathrooms are located throughout Housekeeping Camp (and are not private to each unit). 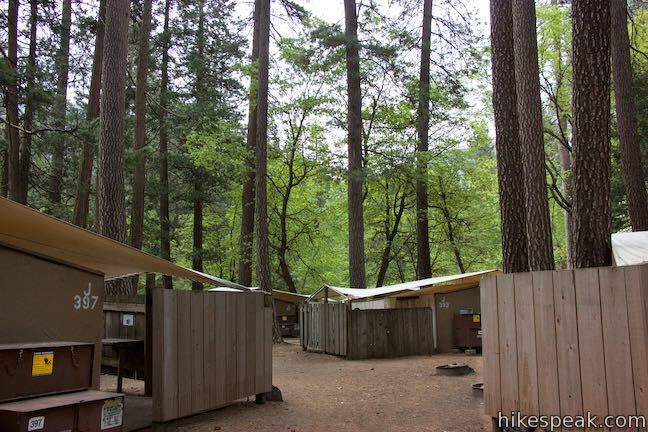 Housekeeping Camp also has showers, which guests can use at no additional charge (non-guest can purchase $5 passes to use the showers, which do not operate by coins or timers). Towels are provided. The showers are open daily from 7 a.m. to 10 p.m., with an afternoon closures for cleaning. 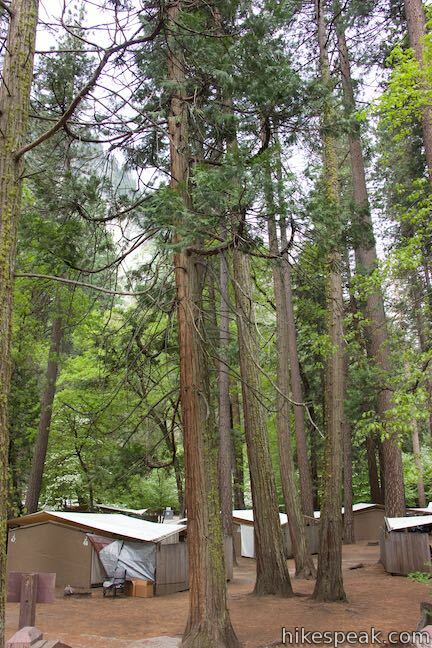 Housekeeping Camp guests also have access to the Half Dome Village Pool. 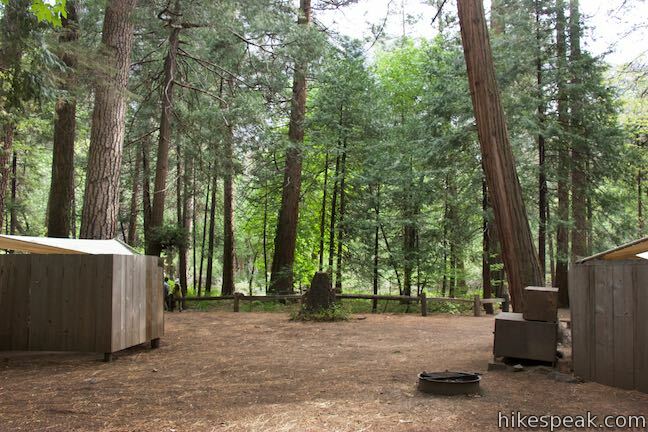 Housekeeping Camp has a laundry room with coin-operated washers and dryers that guests may use to keep wardrobes fresh during Yosemite vacations. Housekeeping Camp General Store sells and rents many comforts that you may wish to add to your stay (in case you forgot something at home). 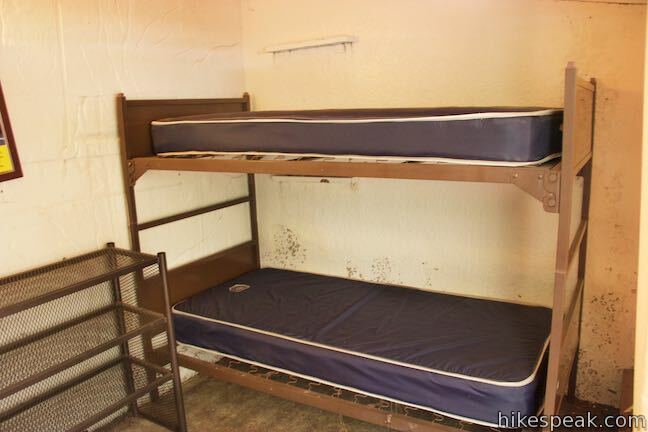 Because the beds in each unit are just mattresses and frames (bringing your own bedding is recommended), you can rent a “bed pack” from the store, which includes two blankets, two sheets and two pillows. Charcoal and firewood can also be purchased at the Housekeeping Camp General Store. 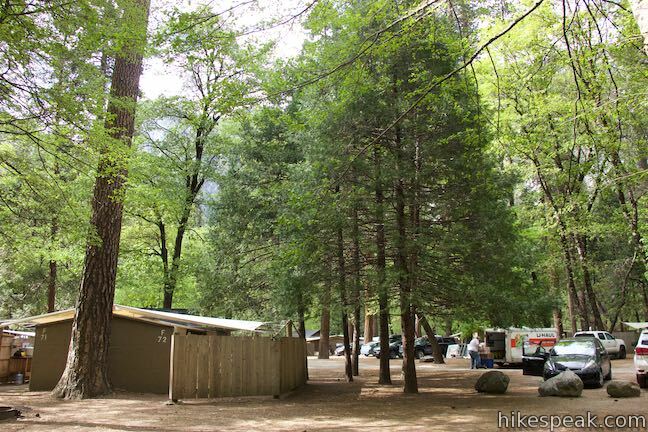 For rates, availability, and booking, visit travelyosemite.com. 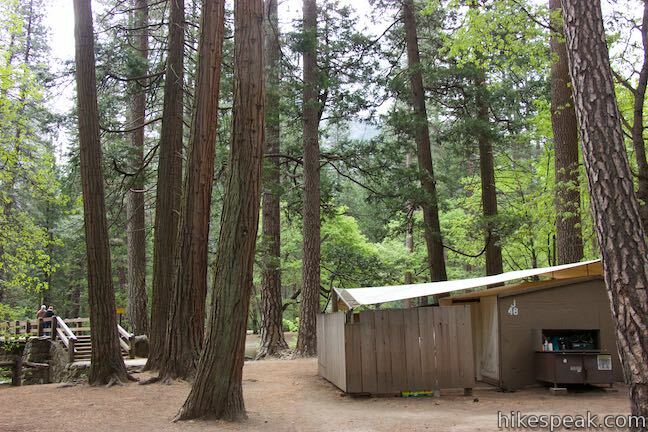 For similar accommodation, you can also check out nearby Half Dome Village (Curry Village). Review the map of Housekeeping Camp when selecting sites. 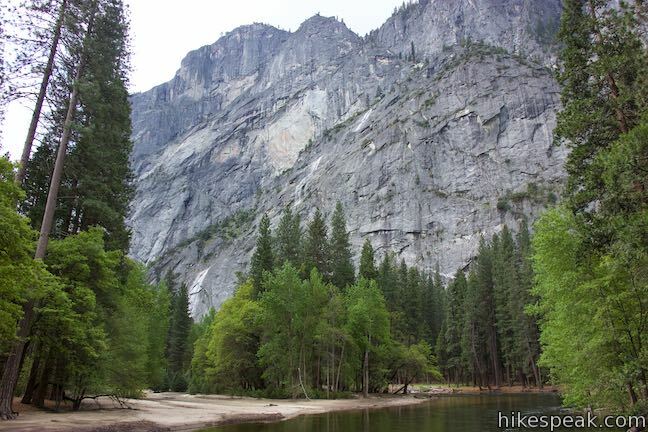 Hantavirus warning: Fatal flashes of hantavirus have occurred in Yosemite Valley. Look over your unit for any signs of rodent droppings before you unpack. Follow all other park recommendations. 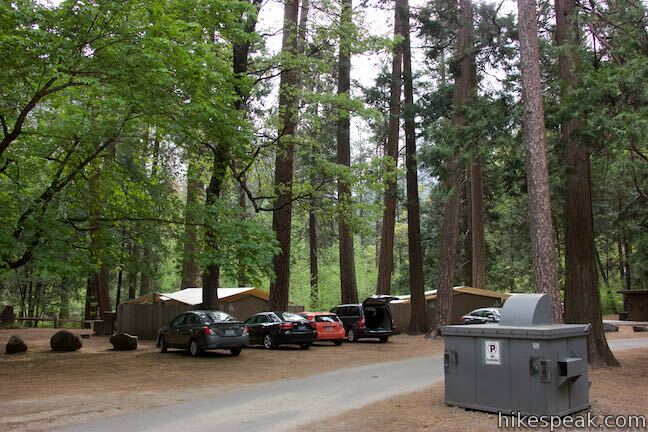 Directions: Drive into Yosemite Valley and follow South Shore Drive for about 5 miles to Housekeeping Camp, which is on the left across from LeConte Memorial. 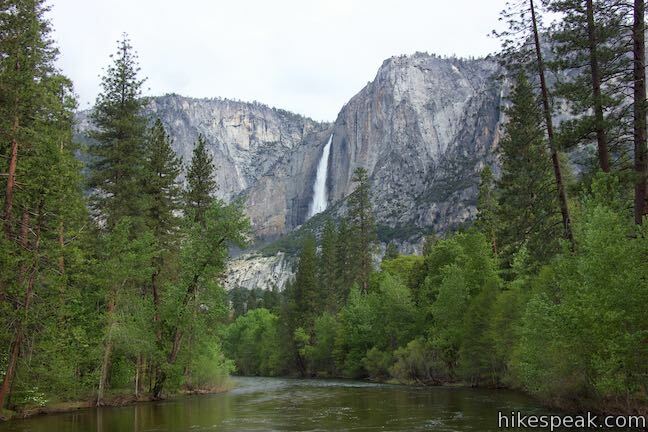 This 1.8 to 6.1-mile hike takes an exciting course past Vernal Fall and Nevada Fall, two of Yosemite’s prize waterfalls.